Horse people know the necessity of having a good pair of muck boots. It is important they keep your feet dry and are comfortable to wear for long periods of time. A really good pair of muck boots is something I have been sadly lacking recently, and its something I’ve been wanting to invest. I wanted them to be easy pull on/off, have some insulation, keep my feet dry and go up to my calves. I also wanted them to be of a decent quality so they would break in well and last a good while. I have always heard a lot of good things about Muck Boots from the Muck Boot Company, so I decided to give them a try. 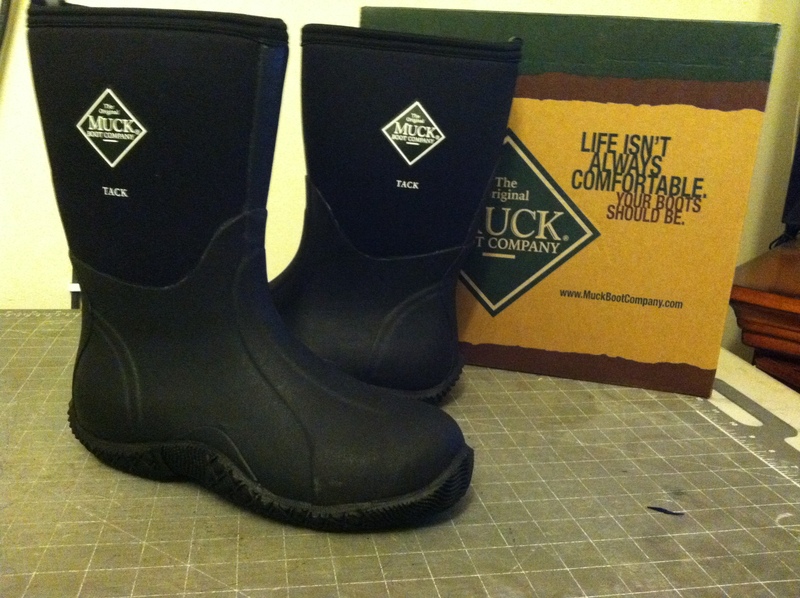 I ordered the 12″ Classic Tack Muck Boot for right at $100. My understanding is that the different styles have more or less grip on the bottom. I like the amount of grip the Tack style has. It’s just enough. I have only used them about a dozen time, but so far, they fully meet my standards. They are warm and dry and comfortable. The neoprene body of the boot makes for nice insulation and is going to be fantastic this winter. And with the way the boot is sealed all around the bottom and up the foot and ankle they are going to keep my toes nice and dry! They are well made and well constructed out of quality products. These boots are going to last a long time. They only come in whole sizes so I ordered up a half size. I also have particularly wide feet, as in WIDE. And they fit my feet great. I can wear some nice thick socks and still have plenty of room, without them being too big. They also pull on and off great. My right ankle does not have a lot of range of motion, so this was a concern. But the boot slipped on and off smoothly. I give these boots my full approval. This is them fresh out of the box before I put them on.